In this post I want to look at the main differences between IELTS general training and IELTS academic training for the writing part of the exam. Writing task 2 is the same, but for writing task 1 it is very different. You will have 60 minutes in total to write for Task 1 and Task 2, which is the same for both the general training and academic training. Writing task 2 is the same for the general training and academic training, an essay of 250 words or over. The essay topics in writing task 2 are slightly easier for the general training. There is a big difference however in writing task 1 for the general and academic training. The above letters could be about complaints, arrangements, making an invitation, explaining something, an apology, a newsletter style, a resignation letter , a request for information or a letter to an ex teacher or professor. There are 3 types of letter in the general writing task 1 exam. However, don’t worry too much about the semi formal style. Just stick to either formal or informal. The semi formal style is a letter to a friend but the situation could be about a work setting or a business setting. In my opinion, if you are writing to a friend it can always be informal, this is a much simpler approach. What is the format for Writing task 1 general? You will always be presented with a situation and 3 points to write about. You must write about the 3 points in the letter. Failure to write about these points will lose you marks and can lower your band score. Be sure to read the instructions so you know which style to use. Write about 45 to 55 words for each of the points. Here are 2 Examples , the first one has to be written in an informal style, the second one will need to be formal. It is very important to structure the letter with paragraphs. Do not just write one big central paragraph or you will lose marks. Here is a common 7 step structure to use for most letters. What about the grammar and the technique for writing a formal or informal letter? 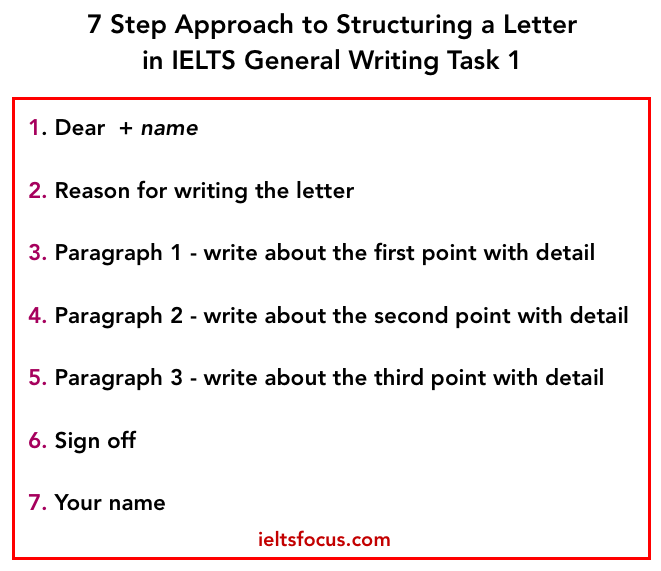 Click here for a lesson on writing an informal letter in IELTS general, there is an analysis and model answer included. Click here for a lesson on writing a formal letter in IELTS general, analysis and model answer included. 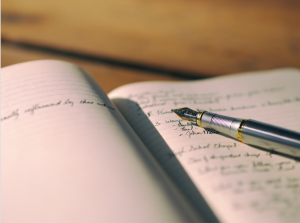 If you need further help or need writing corrections, take a look at our writing correction service here. If you found this helpful please share and like on the Facebook page here, or leave a review.